Summary: The City of Naples Sea Turtle Public Awareness Education Program is an educational outreach program designed to increase local community and visitor awareness of marine turtle issues, with the intended primary outcome of decreasing the negative anthropogenic effects on marine turtles (specifically threatened loggerhead Caretta caretta sea turtle) in Florida. Working in very close cooperation with the Collier County Environmental Services Department to continue their past efforts in this area, the Program staff will utilize a variety of educational outreach tools and strategies to reach the targeted audiences in Naples and Collier County. The goal of the Program is to use educational materials to teach responsible stewardship of marine resources with an emphasis on important habitats shared by both marine turtles and humans. The City has the managerial and financial capability to ensure proper planning, management, and completion of the project described in this proposal. 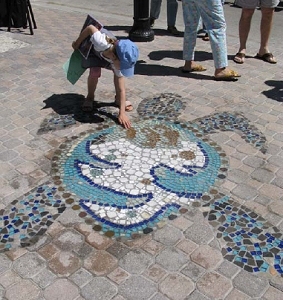 Results: The materials were distributed to the targeted audiences in the following ways: all condominiums, hotels, and residents along the beach were given materials in the pre-season sea turtle packets, at a sea turtle awareness presentation given at the Naples Preserve, the Sea Turtle Homecoming Festival, and many other local festivals (i.e. National Estuary Day, Naples Boat Show, National Marina Day, Coast Guard Day). The first annual Sea Turtle Homecoming Festival was a successful event. It was held on Saturday, March 20, 2010 from 11 a.m. to 3 p.m. Thirteen vendors participated in the event. We also had a local guitar musician as entertainment. Approximately 1200 people attended the festival. As the main activity, we had our Mayor unveil the new permanent art piece installed at the entrance to the City Pier. The artwork is called “Coming Home”. It is of five sea turtles coming onto the beach to lay their eggs. Sea turtles embody the connection the City has with the Gulf of Mexico and our responsibility to the creatures that live within it.